At least 44 people were killed and 65 injured in a suicide bombing at a Shiite Muslim mosque in the southwestern Pakistani city of Quetta yesterday, sparking riots that forced the government to impose an indefinite curfew. Armed policemen and paramilitary troops spread out in the city, as local administration declared the curfew asking people to remain indoors, officials and witnesses said. Curfew has been clamped down in Quetta and paramilitary and police have been deployed to control the rioting," Brigadier Javed Cheema, head of the interior ministry's National Crises Management Cell, told AFP. Asked if the security forces had been given orders to shoot rioters on sight, Cheema said it was "normal procedure in a curfew situation." The attack took place during Friday prayers. Reuters adds: At least one suicide bomber blew himself up in the mosque in the centre of the city. A senior city official in Quetta said the death toll had risen to 44, after Information Minister Sheikh Rashid Ahmed had earlier told Reuters that more than 20 people were dead. Another 65 were injured in the raid, which sparked angry protests among Shi'ite Muslim Hazaras. President Pervez Musharraf, in Paris on an official visit, condemned the violence and vowed to punish the perpetrators. Khadim Hussain, a Hazara Shi'ite from Quetta, said he counted 24 bodies in the hospital morgue, including those of three children. Khan Ali, 60, who was slightly injured in the attack, said he was praying at the mosque at the time. "I saw bodies blown into pieces," he told Reuters. Mahmood Hussain, who was also in the mosque, said two bearded men fired on worshippers before a third person blew himself up. Another witness recalled seeing two suicide bombers enter the mosque before setting off explosive, while the information minister said there were three attackers. Two suicide bombers died instantly while a third later died of his wounds, according to Ahmed. The attack happened at Quetta's main Shi'ite mosque, raising suspicions that the motive was sectarian. Violence between the Sunni and minority Shi'ite sects of Islam has erupted in Pakistan this year after a relative lull during 2002. Angry crowds of Hazara Shi'ites, some of them armed and firing shots into the air, took to the streets and gathered outside the hospital where the bodies and casualties were taken. 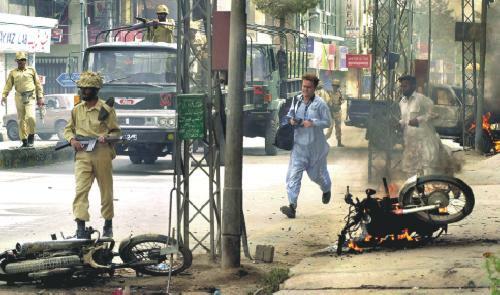 Vehicles, shops and a wing of the hospital were set ablaze and the army was called in to control the situation. Crowds began to disperse after paramilitary troops used loudspeakers to announce a curfew. "We have to act very strong against them," he told reporters. "As I have always been saying, it is unfortunate that some elements in Pakistan are undermining what Pakistan stands for. It is unfortunate that this small minority are able to derail or undermine national feelings." The attack will come as an embarrassment for the military leader, who used his trip to Europe to calm investor fears about security in Pakistani following a spate of attacks on Western and Christian targets last year based on Islamic militants. They have abated, but sectarian violence is on the rise. In the southern port city of Karachi in February, nine Shi'ites were shot dead outside a mosque by gunmen on motorcycles. Days later, two more Shi'ites were killed. Less than a month ago, 11 police recruits were killed and nine wounded when gunmen opened fire on their vehicle in Quetta. All were from the Hazara tribe, which is Shi'ite. The Quetta mosque attack overshadowed protests in major Pakistani cities called by the Islamic coalition critical of the pro-military government and Musharraf's sweeping powers. Leaders of the bloc called on supporters to take to the streets in protest over the disqualification of a parliamentarian on the grounds that he did not hold a university degree. But only a few hundred people gathered in support of protest, carrying placards with anti-American and anti-Musharraf slogans.